Pomegranates - dark Challah covers CAT# CME - 6. 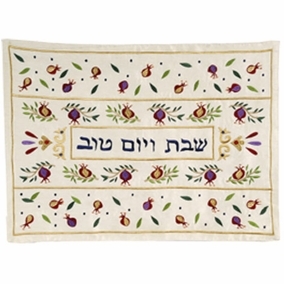 Machine embroidered Challah covers using various colors of silk, gold and silver threads. Size: 20" x 16". 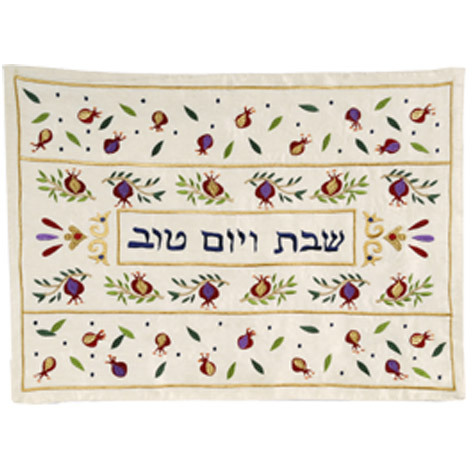 .In Talmudic times, food was served to banquet guests on three-legged trays rather than at tables. These trays were brought to each guest by waiters. On Shabbat, the trays would be brought out only after the Kiddush, to show that the meal was being served in honor of the Shabbat, which had just been sanctified by the recital of the Kiddush.Today, we set the table with the challah, but cover the challah until the time when it would have been carried in, in Talmudic times. Thus we demonstrate that the meal only begins after — and because of — the Kiddush.